Having trouble with the Failed to install a dependency error in Kodi? With the recent shutdown of many Kodi addons and repositories, there’s a chance many addons you’re trying to install are not operating properly. In this guide, we’ll explain what causes this error and how you can fix failed to install dependency errors on any device. Kodi is free, open-source media center software. It has become vastly popular in part because of how customizable it is, but also because of its high portability. Kodi can be installed on almost any popular device including iPads, Amazon Firesticks, and Android phones or tablets. Further, mobile versions of Kodi keep most of the functionality of the desktop versions. Usually, installing Kodi addons is quite straightforward. However, you might experience issues that prevent the addon from installing properly. In this article, we’ll discuss the “Failed to fix a dependency error”, examine the factors that cause it, and help you troubleshoot your Kodi installation to prevent it appearing in the future. 2 What causes the “Failed to install a dependency” error? Some people connect to virtual private networks (VPNs) in order to hide unlicensed streaming from their internet service provider (ISP). Despite this, there are numerous benefits to using a VPN even if you only stream from official sources. VPNs encrypt your network traffic so that it cannot be read by any outside observer. This prevents most types of Man-in-the-Middle (MitM) attacks and also stops your ISP from selling your browsing habits. Also, because your ISP can’t see what you’re doing, they can’t use your activities to justify throttling your network speeds. Every VPN is different, and choosing the right one is crucial. Some keep detailed logs of your activities that can be traced back to you fairly easily. Other VPNs have been known to include malicious code, or make their user’s computers part of a botnet. We recommend IPVanish. It has minimal impact on your browsing speeds, allows you to connect to servers in more than 50 countries, and is extremely portable. Additionally, IPVanish is the only major VPN available in the Amazon Firestick app store, meaning you can stay protected even when away from home. What causes the “Failed to install a dependency” error? Kodi has a thriving third-party addon development community. This means that there are dozens of freely available plugins that developers can integrate into their own addons. These are usually installed alongside the addon itself, but if something prevents this from happening, you’ll see the “Failed to install a dependency” error in the top-right of the screen. Usually, this just means that the repository you were trying to download from is offline. That said, as this is quite a vague error message, there are actually a few other potential causes. For instance, problems with the cache or certain files becoming corrupted can also cause Kodi to return this error. Even though the cause of this error isn’t always obvious, it’s relatively simple to resolve. We will have to do a little troubleshooting to find the root problem, however. Most of Kodi’s errors tell the user to check the error logs for more information, but there actually isn’t any way to do this by default from within Kodi. With this in mind, let’s begin by installing the Log Viewer for Kodi addon. 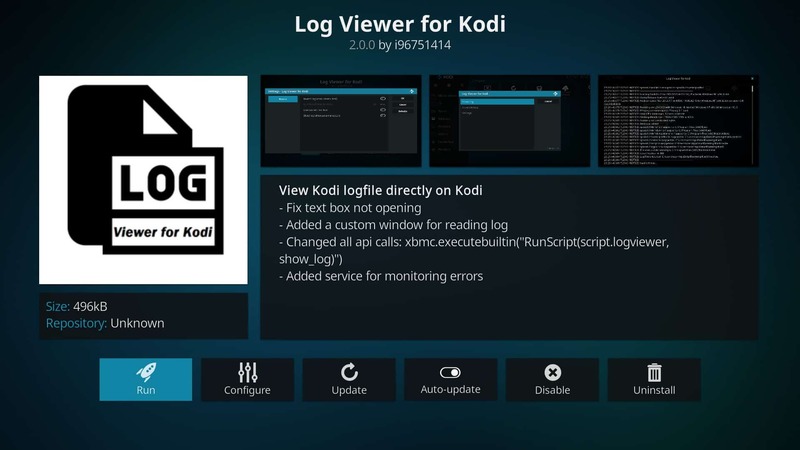 The Log Viewer addon is available from the official Kodi addon repository. This simplifies the installation process since there’s no need to install additional repositories. From Kodi’s home screen, click the Add-ons tab on the left. On the following page, click the box icon in the top-left of the screen. Select Install from repository and scroll down the list until you find the Kodi Add-on repository. Now you’ll see a list of addon categories — select Program add-ons. The list is in alphabetical order so you’ll find Log Viewer for Kodi about halfway down the page. Click it, then click the install button. There’s one setting that needs to be changed before we can begin troubleshooting the problem properly. Right-click (long press if you’re using a touchscreen device or Amazon Fire Stick) on the Log Viewer for Kodi addon and choose the Settings option. Click the Invert Log (most recent first) option so that the button beside it turns white. If it’s grey, click it again to enable it. This setting shows the most recent entries first and saves a lot of scrolling. Since you’ll likely be trying several different solutions and consulting the log each time, this can speed up the process considerably. First, try re-installing the addon that returned the error. Now open the Log Viewer for Kodi addon and click Show Log. You’ll see a lot of technical information but if something has gone wrong, it should be fairly obvious. If a particular file wasn’t found or the connection timed out, and you’re definitely connected to the internet, that’s a good indication that the source you’re trying to install from has moved or been taken offline. In this situation, the addon should install properly once you find an alternate source. It is important to only use trustworthy sources, however, as in the past, rogue developers have reuploaded popular addons and used them to release unsafe updates. You can find out which dependency failed to install by looking at the popup in the top-right or by consulting Kodi’s error logs. Once you’ve identified the plugin or addon that’s missing, try doing a Google search to find a reputable source for it. We’ll use the URL Resolver plugin as an example. By searching online, you’ll see that the URL Resolver is currently hosted by TVAddons. When you install the TVAddons repository, it also installs or updates certain tools including the URL Resolver. Sometimes you’ll find that the dependency is only available as a zip file. In this case, you can install it in the same way that you would an addon. Click the Add-ons tab on Kodi’s main page, then select the box icon. Click Install from zip file and navigate to the file’s location on your hard drive. When you click on it, it should install. Now try installing the original addon again to see if your problem has been resolved. If you find that you’re missing multiple dependencies, you can either repeat this process for each file or reinstall Kodi. This option may seem drastic, but it’s often the fastest way to resolve these kind of issues. Note: while we can’t verify that this will solve your problem, clearing Kodi’s cache is a commonly proposed solution on various other websites and forums. The cache is where Kodi stores data that need to be accessed quickly. Usually, the cache is supposed to empty itself but occasionally problems arise and the cache fills up entirely. In these cases, Kodi can begin to struggle and may return errors like the one we’re trying to resolve. The good news is that if a full cache is the root cause, it’s very easy to fix. Kodi doesn’t include any easy, cross-platform solution to clearing the cache but the Indigo addon contains maintenance tools that can do this for you. Click the gear icon on Kodi’s main page and select the File Manager option. You’ll see a list of all the sources you’ve added so far. 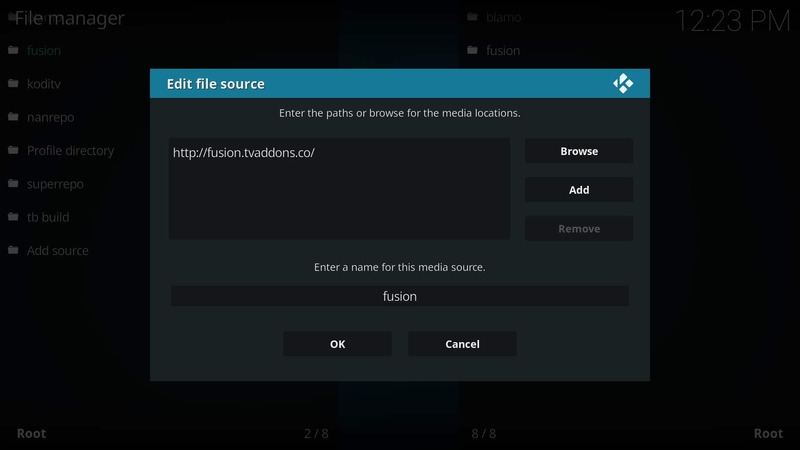 Click the Add source option at the bottom of the list, and enter the following without quotation marks “http://fusion.tvaddons.co”. Next, return to the home screen and click Add-ons, then the box icon, then Install from zip file. Find the source you just added in the list and select it. Click the begin here folder and install the Indigo addon inside it. The first time you run Indigo, it might take a minute to start up. Once it does, click Maintenance Tools, then Clear Cache. You’ll be asked to confirm the deletion, so click Clear then restart Kodi. If the cache was causing your issue, you should now be able to install the addon without any problems. If you’re having difficulty installing third-party addons, the problem may be that the URLResolver plugin isn’t working properly or is missing. 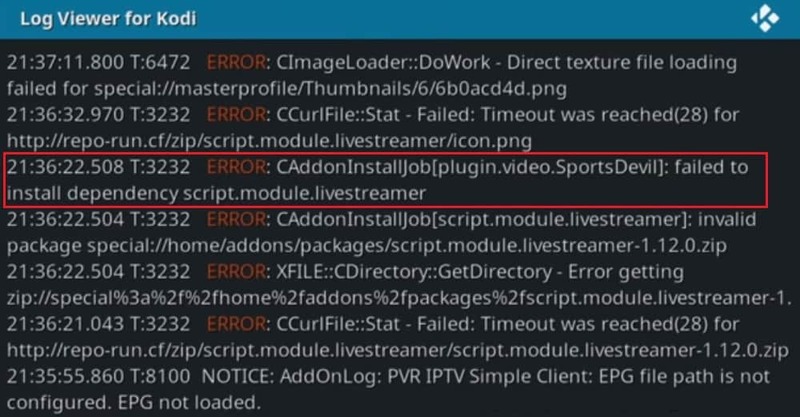 This plugin was moved recently so if you haven’t used or updated Kodi in a while, this might be the reason you’re seeing the dependency error. If you added the source in the previous step, getting the latest version of the URLResolver addon is very simple. Go back to Kodi’s Add-on Browser page and choose Install from zip file. Click the source, then choose the following options: kodi-repos > english > repository.xbmchub-3.0.0.zip. If you have automatic updates on, the URLResolver should update on its own. However, we advise against this setting due to the potential for malicious updates to install before you’re aware of any issues. 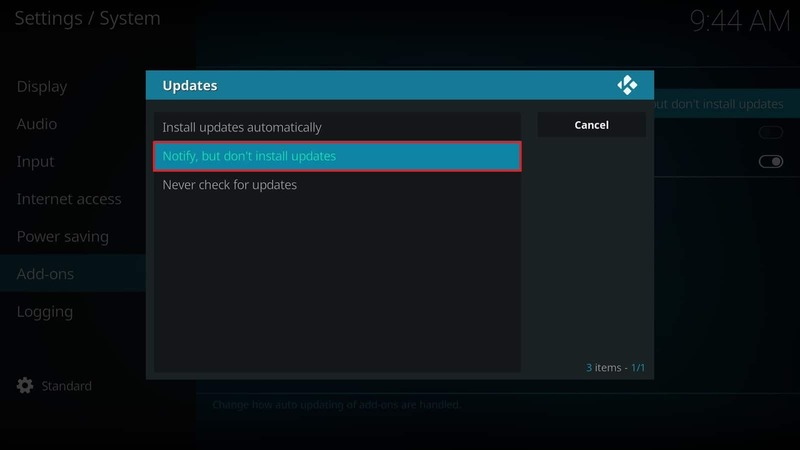 You can turn automatic updates off by clicking the gear icon on Kodi’s main page, then selecting System settings. Now just hover over the Add-ons tab, move over to the right and click the Updates option. We recommend setting it to Notify, but don’t install updates; this way, you’ll have the option to research available updates before installing them manually. If the previous solutions haven’t resolved the “Failed to install a dependency” error, the easiest solution might be to reinstall Kodi. You can do this by uninstalling Kodi, then visiting https://kodi.tv/download and choosing the right version for your operating system. Once it downloads and installs, you’ll have a clean slate to start from. You can also reset Kodi to its default settings using the Indigo addon. To do this, open Indigo and click the Factory Restore option. You’ll be prompted to confirm that this is what you want. It’s important to note that both of the above solutions will cause you to lose all currently installed addons, plugins, and builds. The Failed to install a dependency error can be annoying, but it’s usually fairly easy to resolve. If you’re experiencing other issues, you might want to read our guide to fixing Kodi’s most common problems. We have also written articles that will help you make the most of your Kodi installation. These cover everything from reducing buffering time to installing a VPN, or finding the best addons. Don’t worry if you’re new to Kodi; all of our tutorials are written with beginners in mind. I have cleared cache, data and even reinstalled but still getting the error.